Since I have had a cold smoker, my favourite thing to make regularly has been smoked salmon. It is infinitely better than what you can buy from the supermarket. The texture is much firmer and less slimy than the vac packed variety and the flavour is intense, but not fishy. Here is my recipe for home smoked salmon. Because I now always have smoked salmon off-cuts, I needed to produce a recipe to use them up. One good thing about producing your own food products is that you are at pains to throw anything away. Considering the statistics of how much food the average British family throws away, that can only be a good thing. Peel and boil the potatoes until a knife goes in easily. Mash them with a knob of butter and some milk to a smooth but still quite thick consistency, season and mix finely diced haddock and smoked salmon in while still hot, this will gently cook the fish. Allow to cool before moulding into four large fish cakes and placing in the fridge to set. Make the lemon and chive mayonnaise. Place the egg yolk, a grind of black pepper, 1 tsp each of lemon juice and cider vinegar in a food processor, measure out 100ml of vegetable oil before turning on the processor and slowly drizzling in until you have the right consistency. Be careful not to over-work in the machine of you may split the sauce. Set aside. Remove the fishcakes from the fridge, they should have firmed up nicely. You now need to breadcrumb them. On three plates or bowls, place seasoned flour, egg wash (beaten egg and milk) and finally the breadcrumbs. In turn, dip the fishcakes in the flour, then the egg and then the breadcrumbs to coat thoroughly. These now need to be deep-fried, either in a deep saucepan or deep fryer for between 5 and 10 minutes until crisp and golden. 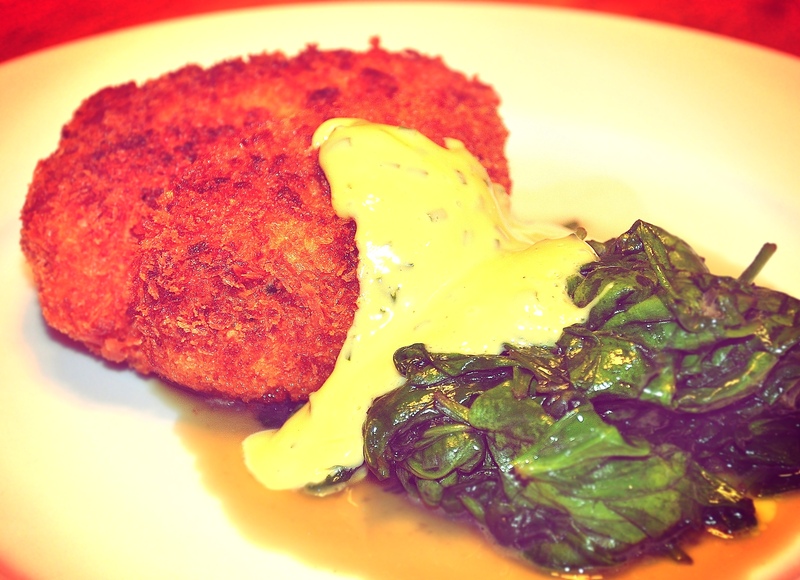 Serve with some wilted spinach and a large dollop of the mayonnaise.